As alluded to previously, one of the things we’re doing is trying to increase efficiency given the existing infrastructure of the house. To wit: we’re replacing the majority of incandescent light bulbs with compact fluorescent bulbs. Now, personally, I’ve never been a big fan of fluorescent technology – I’m one of those people who can hear the buzzing of the ballast and can sometimes see the cycling/flickering that was inherent in the older generation. In addition, there’s something comforting about a good incandescent bulb – it’s warm and welcoming like a fire in the fireplace or a vacuum tube amplifier. 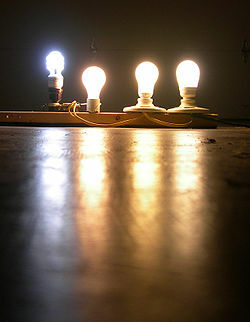 However, incandescent bulbs are extremely wasteful (approximately 90 percent of the electricity consumed a bog-standard incandescent light bulb is emitted as heat instead of light) and – let’s face it – based upon 19th century technology (as is the internal combustion engine – a topic that will be explored another time). As mentioned, my past experience with fluorescent light bulbs has been poor to say the least. Fortunately, or unfortunately, compact fluorescent bulbs have a very long light span, which means it is entirely possible to have some older-generation light bulbs that really don’t look so great and make enough extraneous noise to cause the voices to begin clamoring in your head (or is that just me?). Either way, Sandy and I went to the hardware store last Sunday with the intention (in part) to buy some new compact fluorescent (CF) bulbs. To my delight, I found that someone in the light-bulb business got a clue about designing a usable CF bulb. Instead of the weak, pallid-jaundiced light of the first generation bulbs, you can now choose from a variety of color temperatures (unfortunately, they don’t list the temperature in Kelvins – symbol = K). Thankfully, for me and anyone who happens to stumble across this blog, there’s always Wikipedia. Your old-school first-generation CF bulbs were closest to what is called ‘Warm white’ or ‘Soft white’ and you didn’t have a choice with regard to color temperature. Boo. Hiss. That’s why they were so dim and murky looking when compared to incandescent bulbs. Simply moving up the temperature scale from 3000 Kelvin to 3500 or 4000 Kelvin makes a huge difference. While not as ‘warm’ as traditional incandescent bulbs, it’s not as evocative of a mental institution / hospital morgue as the low-Kelvin CF bulbs were. This is, as Martha Stuart would say, is a good thing. Merrily, I bought a bunch of 100W equivalent (ratings are equivalent to incandescent since that’s what most folks understand – the lumen output is equivalent to an 100W bulb) and 60W equivalent bulbs and brought them home. I decided to go with 100W bulbs in the light fixtures in the kids’ rooms and 60W bulbs in the various table lamps. Bad choice. The funny thing – even to this day – about CF bulbs is that since they are ballast-based, you don’t get the full output immediately upon switching on the lights – it usually takes a minute or so for the light to warm up and give you 100% of the available lumens. When I tested the lights, they looked pretty good. However, later that evening when we were putting away laundry we turned on the lights in the kids’ rooms and stepped out for a second (to put clothes away in our room). When we returned, both kids’ rooms were lit up like a movie set. Clearly a pair of 100W bright-white bulbs were too much for the room. They’re expensive. Sure, they’re supposed to last a long time – much longer than standard incandescent bulbs (excluding the Centennial Light), but they still cost about 5-7x more. They contain mercury. This means don’t drop ’em. It also means that you need to dispose of them correctly. Sometimes you just can’t replace a bulb with a CF – we found that in our son’s room – we couldn’t use a 12V double-pin CF replacement for a halogen mini-bulb because it would flicker – probably due to an out-of-spec step-down transformer in the fixture. They behave slightly differently than incandescent bulbs. I advise buying a couple of different rated bulbs with different color temperatures and try them around the house. Save your receipt and when you decide on what bulbs go where (make a list! ), take the ones you don’t want back – I know, I know, it is borderline dishonest, but what the hardware store doesn’t know won’t hurt them. Especially if it is one of the big-box stores like Home Depot or Lowes that drives local hardware stores out of business. When everything is said and done, you can reduce your household lighting-related energy consumption by a substantial margin simply by switching to CF bulbs. If you are worried about wasting the incandescent bulbs you’ll be replacing, take heart – you can always carefully store them and save them for a couple of years and then sell them on Craigslist or eBay when they are no longer available due to upcoming government bans. This entry was posted in Electricity usage and tagged compact fluorescent bulbs, energy efficiency, Green living, incandescent bulbs, lighting, movie set lighting. Bookmark the permalink.